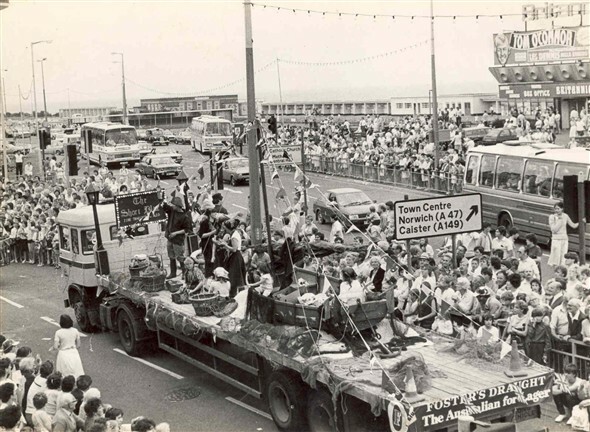 The Yarmouth and Gorleston Carnival, or Float Parade, runs every year during the Summer, travelling either from the Pleasure Beach, all the way along the seafront and over Haven Bridge to finish at Gorleston Beach, or vice versa. It has always been a great event, raising funds for numerous local charitable organisations. As I have had no reply from any show skaters of 1950 1960 about a reunion and I managed to meet up with Derek & Pat Barker ( might recall I was searching for them way back). After talks I wonder if it might be possable to do the same as I did with the old Priory boys school reunion? Thru the Time & Tide musuem cafe - i.e. if we put out a feeler say for skating cast members of Roller Revels 1953 54 & cast members of skating shows up to 1960s to forward names to musuem or onto this webb or on to my email ? Please let me what you think. After the last old Priory boys and girls reunion 2012 a list of your email addresses were forward to me so we could contact. I am putting this on to events so if anyone wants to write a piece on their school, or work or anything in general, can do so either to me or send it to this site. I am sure that Time and Tide staff will help you out. It will make great reading for your future children, grand or great grandchildren.